Helen Rappaport's The Romanov Sisters left me with such heavy emotions that it is difficult to write objectively about it. But I know that I have nothing but praise and admiration for her amazing writing style and the tragic but beautiful story she has to tell. This book brings to life the four daughters of the last Russian Tsar, Nicholas II (reigned 1894-1917): Olga, Tatiana, Maria, and Anastasia Romanov. There have been many books written and movies made about the theorized "survival" of Anastasia based on the real-life claimants/imposters throughout the 20th century, and it is through this media that most of the world knows of the Romanovs. But what Rappaport has done so seamlessly is to tell us of the real lives of these beautiful, tragic girls, to do them justice as real people undergoing true life experiences instead of the narrow, distant views we get of them through the abounding conspiracy theories. The overwhelming poignancy of this book is the discovery that the Romanov girls were so human and relatable, so easy to recognize in our own memories of childhood and those difficult teenage years. With extensive quotes from their letters and diaries, and from the writings of others who knew them well, I felt like I came to know the girls personally. And unlike many spoiled royal children in history, I came to love them. Each of the four were so different with their own personality quirks, and these unique personalities were captured and described perfectly by Rappaport. She brings their lives to us, detailing everything from their childhood games and family activities to their teenage crushes, ultimately unfulfilled loves and broken hearts. They were so real, so innocent and affectionate, and even though I knew their early deaths were inevitable I found myself desperately wishing for a different ending. Their deaths, by the way, are not covered in this book, only briefly mentioned in the final paragraphs. I was shocked and outraged at first, until I remembered that Rappaport warned us about this in the prologue. This is because their deaths, and the final two weeks of their lives, are exclusively covered in an earlier book of hers, The Last Days of the Romanovs. Needless to say, I'll be heading to the bookstore later today. I loved Rappaport's writing style, which was instantly captivating and engaging. She opens the book brilliantly, giving a detailed description of the interior of the Alexander Palace where the Romanovs lived, which they had to leave suddenly after the Revolution. She travels through the palace where the furniture, table settings, room decorations, clothing, and even the childrens' toys were exactly how the Romanovs left them in 1917 (based on early descriptions from the 1920's and 1930's, since during World War II the palace was occupied by German forces and was all but destroyed). Rappaport's prose is lovely and almost reads like a novel, but her historical knowledge and expertise shine through clearly and create a very impressive scholarly work. The book also includes commentary on the famous and controversial Rasputin, as he figured prominently into the lives of the Tsar and his family. There is no biography or inspection of his life, as that is not the scope of this book, but it does illuminate a surprising relationship between Rasputin and the imperial family, very different from what is often portrayed. The children all loved him, and it made me think that he couldn't have been that bad if the girls wrote letters to him confessing their teenage infatuations and asking for his advice about boys! 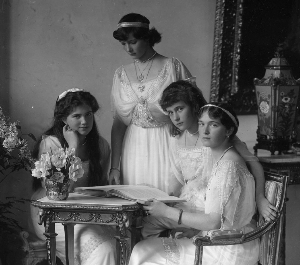 The Romanov Sisters is a stunning achievement. It portrays an intimate, loving family that would have been better suited for a private life than for one on the imperial throne of Russia, a family that was widely misunderstood throughout the country, a family that was brutally executed under the Communist regime following the October Revolution in 1917. 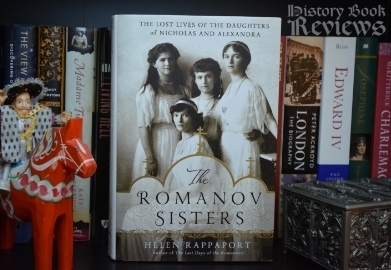 Momentous events like these tend to eclipse the individuals involved, but Rappaport has recovered the striking humanity behind the family that lost their lives so horribly in the revolution and honored the Romanov sisters by committing their all-too short lives to public memory.